Islam is the fastest growing religion on the entire planet, yet it is misunderstood by millions. Islam means peace and submission to God and it is a religion of ethics, obedience, harmony, and is based on a faithful belief system. Interestingly, Islam has also been considered as a religion of cruelty, oppression, and brutality in Western media. The religion of Islam is not a religion of hatred and violence, but a religion of respect for all humans and God. This is the true Islam, the religion of equality, morality, unity, and faith. Islam is divided into many branches but the two major branches in Islam are the Sunni and the Shi’a. Western media always try to create division and conflicts between these two to ruin their relationship and unity. Most of the conflicts and wars between these branches are the result of the media activities. In this project I try to show my own vision of stereotypes about Islam and express my own beliefs. My artwork: a light box made out of white museum board and engraved calligraphy using laser cutter on its body. A lamp inside the box is used for lighting. The calligraphy that I was inspired by is found in the “Blue Qur'an”, which is a late 9th and early 10th century Fatimid Tunisian Qur'an manuscript written in Kufic calligraphy, probably created in North Africa for the Great Mosque (Mosque of Uqba) of Qairawan. The idea behind this project is that each of these parts represents a specific object. 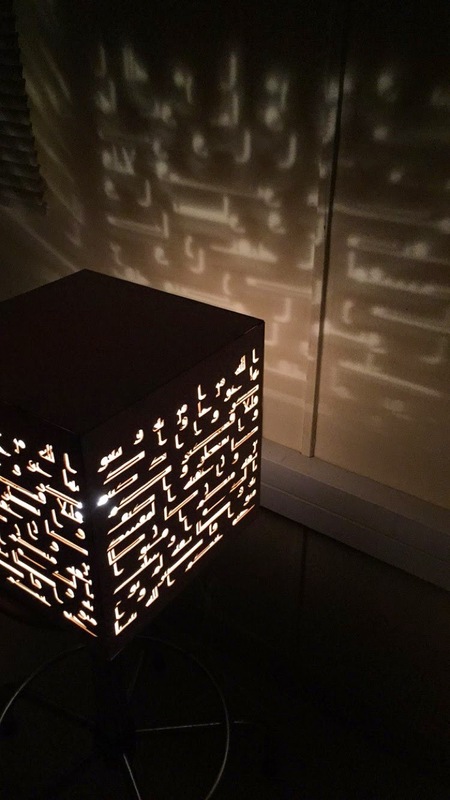 For instance, the light is representing Islam, and the box symbolizes the Kaaba and calligraphy represents Arab societies and Islamic countries. The reason is that Islam itself and the Kaaba are the main reasons for Muslim’s Unity and the light inside the box is the enlightenment of the Arab societies and Islamic countries. Without the light, there is no possible unity, and everything inside and outside the box would be dark. It should be a choice! Islam as it is, not what you think it is!